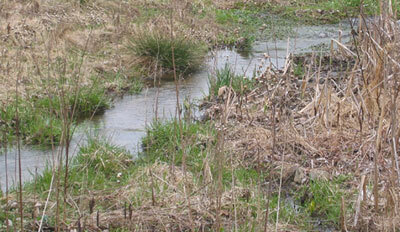 Somehow, in the last year, my brook has turned into a wetland. I suppose it’s a sign or symptom of how out of whack I was for a large chunk of that year that I didn’t even notice it happening. And then, for the last few months, I would see the new marsh from the road as I was driving or walking past and wonder at it. But it was only last weekend that I actually went down to explore it. The upper part of the brook, from the road to the end of the little band of trees and thorn bushes, is still a free-running stream, but from there it divides into many channels, winding in and out among a new bed of water plants — some form of watercress, I think. 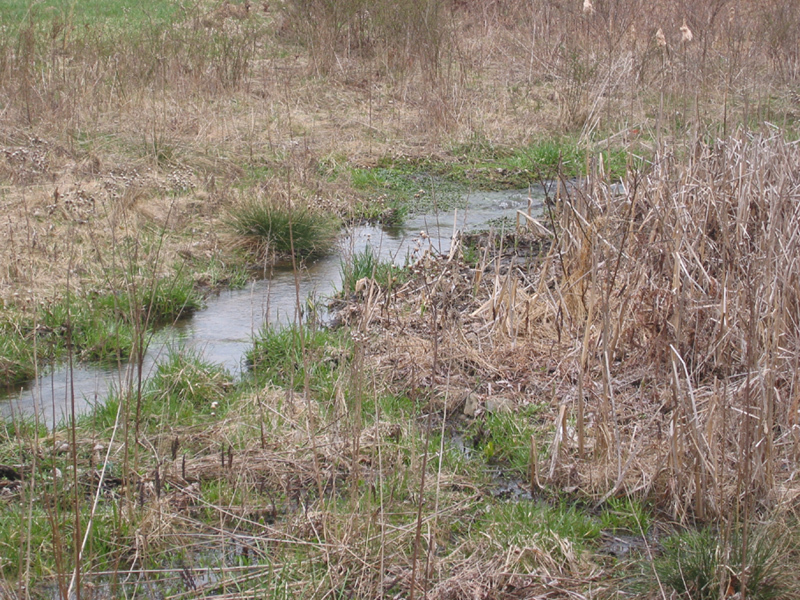 It’s overflowed its banks into the original, smaller patch of cattail marsh as well as into the field on the other side. It’s surprisingly deep in places — while wading, I took a misstep into a hole and almost went in over my wellingtons. I suspect the wetland came about because a large chunk of tree fell on the brook early last year, right at the lower end of my property line. I remember looking at it and thinking that it was too large (and too enmeshed in thorns) for me to move. The water seems to have found ways around it now, but it must have backed the stream up enough to let it spill over the banks and into the low places to either side, possibly helped by last year’s Hurricane Irene. A part of me is a little sad. My father was very house- and property-proud; he would have considered this a disaster, if in fact he hadn’t stopped it from happening entirely. (He used to walk the brook and clear the channel once a year or so.) In general I haven’t been keeping up the property to anything like his standard — witness the invasion of multiflora roses and wild raspberries — and sometimes it bothers me. And part of me loves it. There’s something magical, something liminal about springs and marshes, and especially at this time of year, when they appear like oases of brilliant green among the winter grasses. Too, it makes me think of the Delta region of Kemet, an area that I’m particularly interested in, given it was the location of Per-Bast, the great center of Bast’s worship. The marsh was a place of life, filled with fish and fowl, and also of danger in the form of hippos, crocodiles, and venomous snakes. Above all, it was a beloved place, filled with beauty, as can be seen in numerous tomb paintings. Today in New Jersey, freshwater wetlands are precious in their roles as water purifiers, flood and drought mitigators, and habitats for wildlife, and they’re protected by law. Dua Sekhet, crowned with reeds! Nekhtet! Today I walked down to the stream at the nearby nature preserve, and I was stunned to see how much it had changed since I’d last been there, how its course had shifted. A great, deep bay was carved out of the high bank, a new S-curve had been created, trees had fallen, and a sandbar had been wiped away. I realized then that I hadn’t visited the place since before Hurricane Irene came through in August, perhaps long before that. I don’t remember the last time, and that’s sad, because that stretch of the stream is a very special place for me. So one of my goals for the coming year is to visit the park at least once a week, to reconnect and to follow its changes through the seasons. Hail and praise to you, spirit of the stream! May I be a friend to you; may you be a friend to me. It was the wettest March on record in New Jersey, and towns like Bound Brook have been suffering from severe flooding. The power of the waters is definitely something to be respected and not ever taken for granted. We have some finite ability to channel and contain them, to use them for our own needs, but ultimately they’re beyond us, mysterious in their risings and fallings, stunningly powerful in their gathered force. And that wonder and that terror are ultimately a part of their beauty — are inextricable from it. I grew up playing alongside this little brook, in all seasons and weathers, and later along the larger streams and rivers that it feeds into. I suppose it’s no great surprise (as I’ve said before) that I ended up in a religion where the primal waters and the yearly cycle of the great River’s inundation and subsiding are so central. Even “my” Bast has a strongly riparian presence: Lady of the Pool, of the riverbank, the shimmer of sunlight on the ripples, the low chuckle of the waterfall. And maybe there’s a lesson to be learned in the many faces of the waters: to see how anxiety and exultation, joy and sorrow are different aspects of the same emotional energy, the same inner tide. And to understand that only by acknowledging their interplay and by owning both can I truly know the depths of my own heart. O Netjer, may I walk in a world where Your shining waters bring life and transformation. And may I dare the dregs of sorrow in order to drink deeply of beauty and joy. 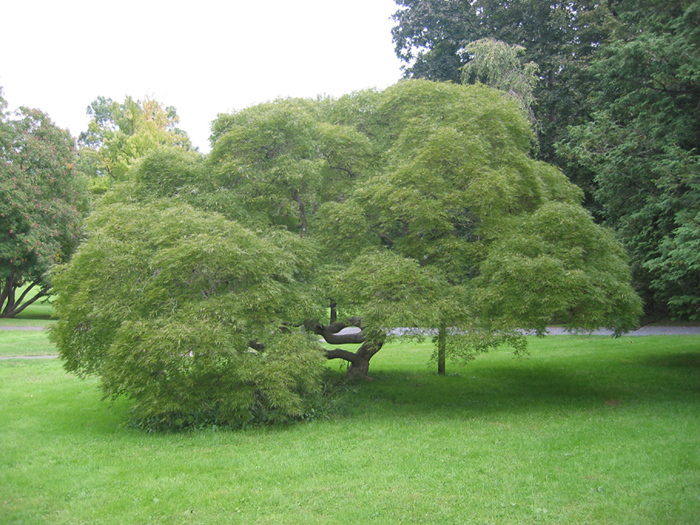 Last week I walked up to Marquand Park one day at lunch, to visit its threadleaf Japanese maple tree. It’s my favorite tree in the park, decked in patches of moss and lichen fans, with its wriggling gray branches twisting and turning intricately upon themselves until they erupt into radiating domes of leaves as fine and soft as grass. 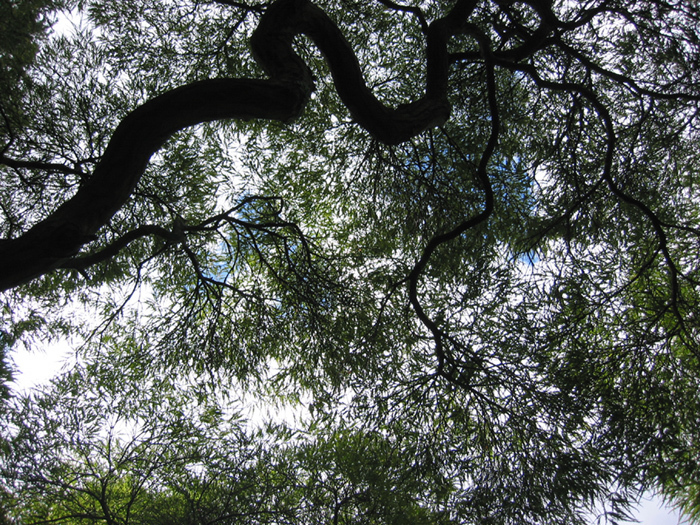 Standing beneath it is like being inside a hill of air and branches, looking up through the shelter of a sheer, living veil to catch fragmentary glimpses of sky. Maybe that’s why it’s the place I go to when I want to feel close to Geb. 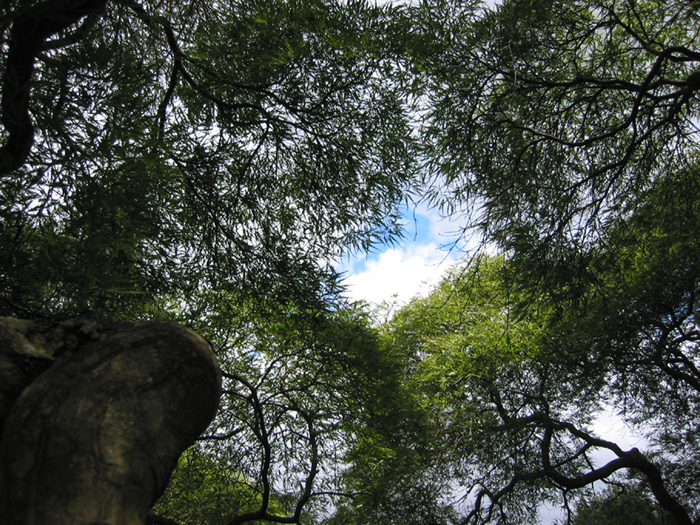 Beneath my feet, there’s the soil, rain-moist, black, and crumbled, and the lush yet delicate grasses that grow in that green shade; beneath my hands, the springy coils of the tree’s limbs catch and shift with the rising wind; above my head, the arch of the tree echoes and yearns for the arch of heaven. A verdant place at the heart of the cosmos, where earth and air and sky all meet in vibrant life, sometimes moving, sometimes still, always at peace. And Father Earth smiles, wordless presence, unfathomable and comforting as the ground that supports me, that cradles me — and Bast my Mother twines Herself through the branches above and behind me, a flicker of stirring breeze through my hair, the warmth of Her regard like a silent purr. May you be strong to endure the wind and the coming winter. May you be flexible to dance with the storms. May you live. May you live. May you live. And as I open my eyes, a bright lance of sun dazzles me, great Ra reaching down through the trees, through the leaves to touch my face. Dua Netjer! Dua Geb! Nekhtet! I went down to the lake at lunchtime yesterday, to sit and watch the reflections of the willows, the sun, and the passing clouds, to drop leaves into the water and watch them turn in the slow, eddying currents. Sometimes patience is so hard. Taking time is so hard. It seems as if it should be easy, just living, just letting things come. I know that there are ways to rest, even while in motion, but somehow, far too often, I don’t. This week has been about finding that rest: playing with the new kittens, sitting and reading in the evenings (more pleasure reading than I’ve done all summer! ), doing the one thing that just has to be done each day. This week has been about kindness to myself. And I think I’m starting to feel the fruits of that kindness: a little more clarity, the feeling that I might be able to start writing in earnest again. Tonight I’ll pour water for Khonsu, beneath the waxing moon, and for the Seven Arrows of Bast, in thanks and in prayer. Dua Khonsu! O Shining One, Great Healer, may You watch over me. Dua Bast! Beautiful Mother, may I rest peacefully in Your embrace. So the path was closed, but I went around the long way, through the maze of fenced-in small athletic fields, trying to figure out how to get to where I was trying to go. (I could have just gone the really long way, around the fields altogether, down through the woods and back along the bottom path, but I was curious.) I thought I was walled in for sure at one point, faced with a wire fence that there didn’t seem to be any way out of — and that would have been okay, since I found a good sitting stone there, at the foot of a silver beech tree, with a fine view of the water. But after a few minutes I went on through the trees and finally found a break in the fence where they’re in the midst of installing a new one (to be electrified eventually, but fortunately not yet). From there, I was able to follow the nature-walk path — open at the bottom end — up onto the hill, and spend a little time right where I wanted to be: at the top of the cutting, about thirty feet above the crossroad, looking out across the bridge and the lake, listening to the wind roar in the treetops and hiss in the rattling beech leaves and tall, sere grasses, and talking to my various gods. It was good. And coming back, I was able to pinpoint exactly where the path closure is, so in the future I can get around it without quite so extensive a diversion. But still, it was a fun detour. There’s a lot to be said for going woods-romping on one’s lunch break. And the wind! Shake-you-to-the-heart wind, powerful and fierce, yet warm and vital and alive. Because everywhere is Egypt, She said to me. Everywhere the ducks fly, everywhere the water flows, everywhere the sun’s light falls. I’ve been trying to think of a word for what the river means to me. Metaphor isn’t quite it, although it does partake of metaphor. I’ve used the river before as an image to describe my conception of Netjer, the fluid, often arbitrarily demarcated boundaries that on another level blend into unity, not just tributaries flowing into a larger watercourse but the entirety of the river basin and all that it contains. (A shift in perception: Is the slow, weed-choked widening in the stream separate from the satin-slick surge of current where the channel suddenly narrows? Where does one state transition into the next? And would the river be the same without the shape of the hillsides that funnel runoff into it, or the species that live within and around it, or the wind patterns that bring the rain? And yet you can point at the river, naming it as a singular entity, and doing so is both informative and useful.) The river is connection, like the image of the world-and-heavens-spanning Tree that it’s branching structure reflects; it’s journey, and in that it’s also life in the sense of arising, passing through different states and environments, and merging at last into an unfathomable depth, or else evaporating into the sky. It’s life as well in that its waters sustain the life around it, life in that it cradles and contains life within it. I live now — and have lived for nearly all of my life — in a watershed valley. 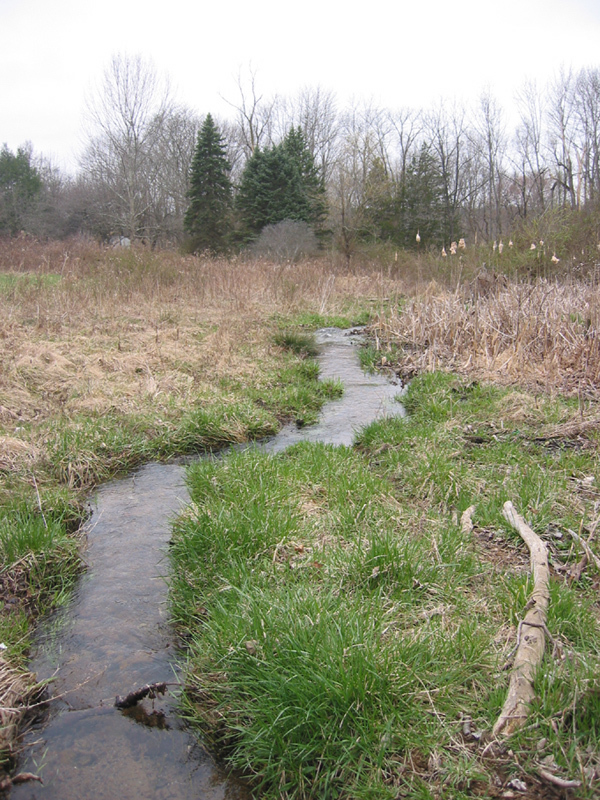 The brook that cuts across my property flows into a stream that feeds the North Branch of the Raritan and thus the Raritan itself, and ultimately ends in Raritan Bay and the Atlantic Ocean, if it can be said to ever truly end. 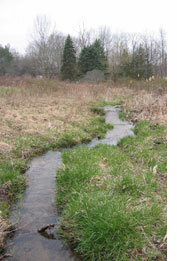 I grew up playing by streamsides, and so I guess the sound and movement of the water got into me early. And the colors — fierce green of the tender new grass around a tiny spring-fed trickle, early in the year before the fields have really come back; mellow amber of the sun’s light on the rounded, leaf-shrouded stones of the river bottom; slatey or silvery or midnight blue flashes where the water’s surface captures the sky. So to me the centrality of the river to the world of Kemet, the way that Egypt and the Nile define each other, is an important point of personal congruence, a resonance that makes me feel at home. One of Bast’s more obscure epithets is Shet, She of the Pool, and that’s one of the many faces of Her joy: the coolness, the lightness, the vivid sensation, the liquid shiver of delight. And I could probably go on and on at great length about where and how this aspect merges into some of Her other ones — Eye of Ra, Lady of the Perfume Jar, nurse and protector of the King, Firstborn of Tem — but that’s probably better suited for a book (someday!) than for the blog. What lifts me up? I echoed in my last post. Well, I think I figured out why the idea of hush was so particularly attractive, considering that last night in shrine I suddenly realized just how perilously close to burnout I am right now. I’ve been running nonstop on two tight writing deadlines, one personal, one freelance, and today I had to take a little break from the personal project, at least. So I got out into the air — went for a walk, down to the stream in the local nature preserve, enjoying the chuckle of the water, the flood-flattened grasses underfoot and the clumps of dead, dry plant stems reaching high above my head, the tangles of thorns, and the beads of ice catching light, dangling from the branches that reach almost down into the river. And I was thinking, standing at last on the small, rocky beach, about a series of elemental exercises that I was doing not too long ago. In particular, I was thinking about water, and I went back to it again, asking myself, “What do I love? What lifts me up?” And the immediate answer was, This. Sometimes I have fits where I want to run away from this place — just run anywhere, really. And for a long time I thought that maybe that was the call of my soul, a longing to go on a quest to find my true self. But times like this I recognize that my true self is here, if it’s anywhere — in the everyday and the extraordinary, in the stress and the relief of stress, in this place that’s so familiar and yet still holds so much that I love and that I want and need to discover. I’ve lived here for almost all of my life, and today was another reminder this land and the river live in me, too, and that they can still amaze me. Last week, during the long weekend, I went for a walk at Natirar, a local park along the North Branch of the Raritan River. It first opened to the public sometime within the last few years, but I hadn’t gotten around to checking it out before — and admittedly that day might have not been the best time for a visit, considering that it was intensely foggy and the ground was still covered with an icy crust of snow. But I had an imperative need to go for a walk by a river, so off I went along the path less traveled by, over the creaking, half-melted ice sheets and down to the water’s edge. And there was one point, as I was walking next to the river, where the great field opened out on my other side, an expanse of snow vanishing into the fog that came down to meet it — imagine white on white, so that the eye struggles to find something to focus on and fails, so that vision blurs and all the dark floaters that one usually doesn’t notice dart and crawl like tiny insects across one’s sight. Eerie and wonderful, like suddenly being set adrift in another, dreamlike world, utterly empty, with only the murmur of the river for company. Today is the Feast of Sokar, hawk-headed God of the moment of suspension, the instant of perfect stillness between day and night, life and death. And here we are almost on the tipping point between the old year and the new. Tonight, I want to make time for stillness, for silence, to feel that hush once more before I step forward into a new and extraordinary world.